We had the reigning US Champion in attendance this week, yet he wasn’t even our top ranked player, as GM Jan Ehlvest held that distinction. Rounding out the field of Grandmasters was Alex Stripunsky. We actually had two national champions playing in this event, as the champion of USA and Canada were both competing, as IM Pascal Charbonneau was also in attendance! Also NM Mike Klein said to mention him in this report, so I guess ummm, hi Mike! Mike is the coach of IS 228, the team led by NY Master regular Alex Lenderman. They recently won the open section of the National Junior High School Championship. NY teams dominated the event as IS318, coached by Elizabeth Vicary, won the Under 1250, Under 1000 and Under 750, thus giving NY a clean sweep of all the team prizes. 1 Ehlvest – J.Shahade LIVE GAME!! There weren’t many surprises in the first round. The qualifier, Yucet Sori, had great chances against Charbonneau but ended up botching up a rook and pawn endgame, and allowing the Canadian Champ to queen a pawn. Privman defeated Stripunsky last week in shocking fashion, but this week fell victim to a very common opening trap and lost right away. 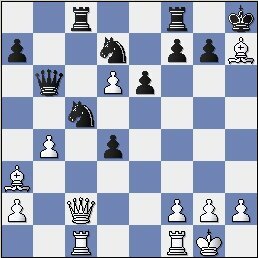 (1.e4 d6 2.d4 e5 3.Nf3 Nd7 4.Bc4 Be7 5.de5 de5 6.Qd5!) It’s funny because Privman knows about this trap, as he has avoided it every time he’s played me in this variation. 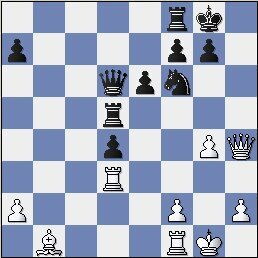 In last week’s NY Masters, I had this same position against Ehlvest and played the incorrect ….Bxf3. Nice to see that Jenn knows this move order better than I do. A nice, thematic move. 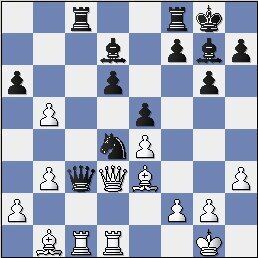 Nd7 breaks the pin on the d-file and also threatens …c5, which would win a piece after Qa3 b4. Ehlvest goes through some contortions to deal with black’s threats. A powerful blow, wrecking havoc in white’s position. Once the knight moves, the queen will come to h3 with incredible force. GM Ehlvest seems to be in serious trouble early on in this week’s NY Masters! Ehlvest finds himself forced to give up a pawn. Let’s take stock….Jenn has a solid extra pawn and also a nice attack on whites king, after ideas such as …Kh8 and Rg8. On the other hand Jenn’s Achilles heel was beginning to rear it’s ugly head, as she was nearing 5 minutes on the clock. 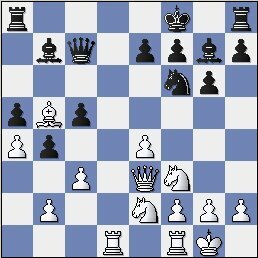 Increasing the pressure…..white is forced to place his pieces in passive defensive positions. All of the sudden white is getting counterplay, and Jenn Shahade is down to her final minute or two on the clock….. This may have been a bad practical decision, all of the sudden the e-file is open for the white rooks. A close shave for Ehlvest, but he doesn’t repeat his first round woes of 2 weeks ago (When he lost in round 1 to Lev Milman) and thus moves to 1/1. 2 Shabalov – Stripunsky LIVE GAME! There was a quick upset in round 2, as The Bone took out last’s weeks champion, Jan Ehlvest. Ehlvest came close to defeat in the first round and finally succumbed in round two, when he lost an exchange to Bonin and had to shortly resign. 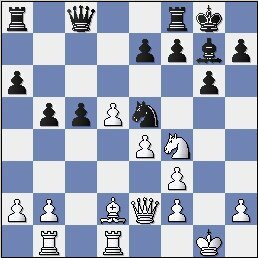 Charbonneau looked to have a difficult position, when suddenly Ziatdinov gave up a piece and with it the game. Let’s check out the GM vs GM battle, in just the 2nd round! 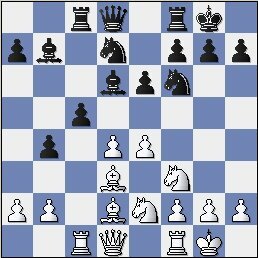 The fans thought that Stripunsky may be in big trouble at this point, as Shabalov had made all of his moves instantly, and Stripunsky had spent about 10 minutes, not to mention that black’s position looks rather suspect. And Shabalov has two bishops against two knights! Yikes! 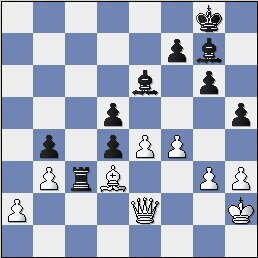 This move attacks the knight on c5 and black can’t move the knight because white would have Qxc8. 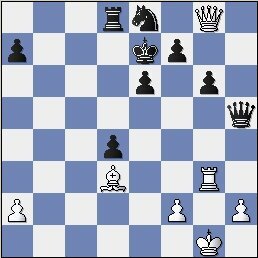 Stripunsky is forced to give up his h7-pawn. Attacking the bishop on a3 while defending the c8 rook. The crowd went NUTS when Qh4 was played, and also went nuts when Stripunsky instantly replied with …Nf6! 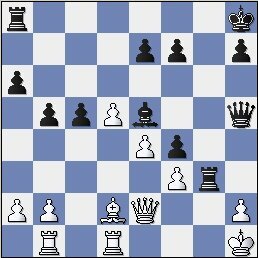 Stripunsky missed …Qxc1, winning the game at once, as the queen come back to h6 to block any discovered checks. Shabalov is really going for it now! The immediate Rh3 didn’t work because of …Rh5, but now it becomes a threat. Stripunsky flees with the king, although there is nothing scarier then being attacked by Shabalov, one of the best attackers in the nation. Stripunsky has done a fine job of defending, as Shabalov can make no easy headway against the black king. He reacts by sacrificing more material!! 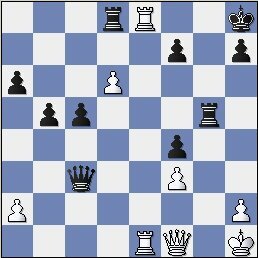 40.Bxg6 fxg6 41.Rxg6 Qf5 42.Rh6 Rc8 43.Rh7+ Kd6 44.Qg3+ Kc6 45.Rxa7 Nc7 46.Qb3 Qg5+! A valiant attempt by the US Champ now ends in bitter defeat. 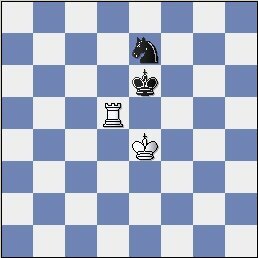 Next move Stripunsky can trade queens by force, leading to an easily won endgame. Charbonneau moved to 3-0 with a win over Gershov, and now he had to wait it out to see who would join him between Stripunsky and Bonin. 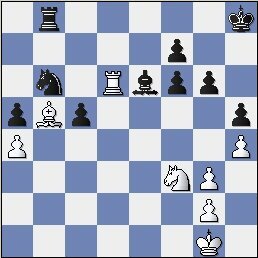 Bonin is known for his historically bad results against Stripunsky, so he could not have been happy to sit across from him in round 3, however perhaps he gained some confidence from his round 2 victory over Jan Ehlvest? As you can see, Stripunsky was unable to drum up sufficient counterplay for his sacrificed pawn. 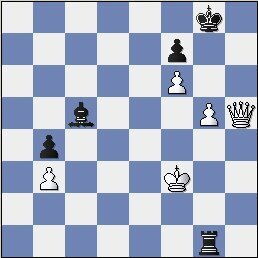 Bonin has two extra pawns, it looks like he is well on his way to a very much desired win over Alex Stripunsky. With a win, it would be Jay Bonin’s first ever 3/3 start! All the sudden things are looking much more bleak for Bonin, as he is in serious danger of losing this game! It’s hard to have a winning position go to a better position, to slightly better, to equal and then to worse. Usually one goes all the way to losing in such situations, especially when Stripunsky has such a psychological edge over Bonin. Jay had to be happy with this turn of events, as rook versus knight should be an easy draw. Yet how easy is it with the clock ticking and with only one minute remaining? Despite drawing his nemesis, Jay had to be very unhappy as he had an overpowering position. Meanwhile Stripunsky gets a new lease on life and gets to play for the title in the final round against Canadian whiz kid, Pascal Charbonneau. 1 Charbonneau – Stripunsky LIVE GAME! The last round showdown is here and it’s going to come down to Canadian Champ, Pascal Charbonneau, and GM Alexander Stripunsky. Stripunsky is a half point behind Charbonneau, thus he will need a win for first place. Meanwhile, Jay Bonin is also in the running with 2.5/3, but to join the winners circle he will have to knock off the US Champion, Alexander Shabalov! Stripunsky plays his usual sharp Sicilian defense, needing a victory for $350. 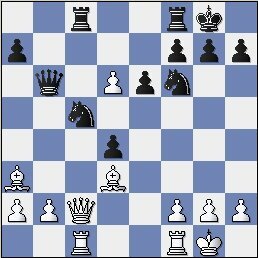 Charbonneau has to be happy with the opening outcome, as he has a very solid position, with no weaknesses. Stripunsky will be torturing himself trying to come up with some active plans here. 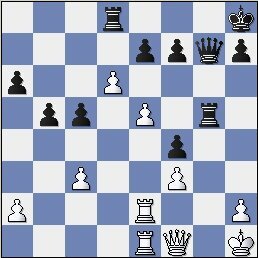 16...Nxf3+ 17.Qxf3 Nd4 18.Qd3 e5 19.Be3 b5!? And here we have it! Stripunsky has definitely found a way to mix the game up! However, does this give him any real active play or just hand white a clear advantage on a silver plate? 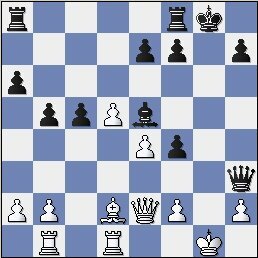 This move was criticized by the crowd……it seems foolish to open up the position for blacks two bishops. 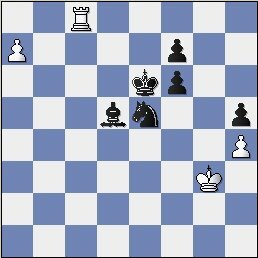 Now black has ideas of Rc1-h1 mate. 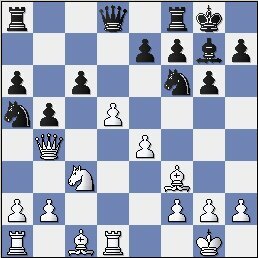 It was felt that e5 would be sufficient to hold a draw and thus first place, but perhaps Charbonneau now wanted to play for the victory? 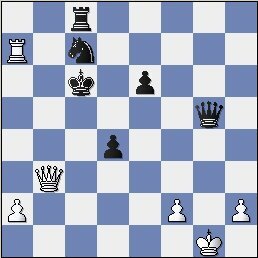 Shutting the king in, renewing the idea of Rc1-h1 checkmate. 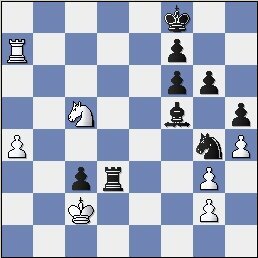 White does not have to allow checkmate after Rc1 of course, but it’s at least something for Stripunsky to dream about. 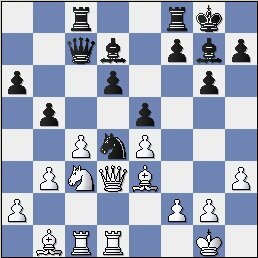 Charbonneau has removed his king from the corner and brought it to perhaps a safer spot on f2..
And now Charbonneau is on the counterattack!! 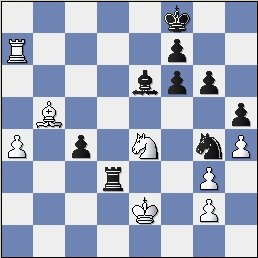 White is threatening fg6 and in some cases f6! What can Stripunsky do? It’s time to forget about winning this for black and think about holding a draw and taking a piece of 2nd place. Things are beginning to look very hopeless for Stripunsky, black’s position is hanging on by a thread. Amazing! Black is planning to set up a fortress! With the rook on the g-file, shuttling back and forth, how can white make any progress? 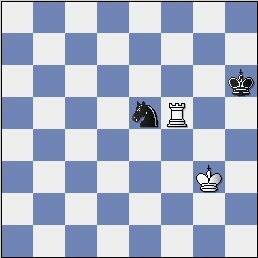 The b-pawn is firmly defended and white can never play g6 or approach with the king. If the king ever goes to e8, black will just push it back with a timely check on the e-file. 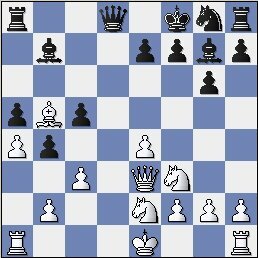 Let’s see what Charbonneau can come up with, as I’m sure he wasn’t happy with drawing and clear first, but also wanted to defeat the Grandmaster. 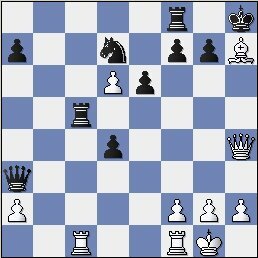 54.Qxh5 Rg3 55.Kc4 Rc3+ 56.Kd5 Rd3+ 57.Ke4 Rg3 58.Kf4 Rg1 59.Kf3 Bc5? And the fortress falls apart! 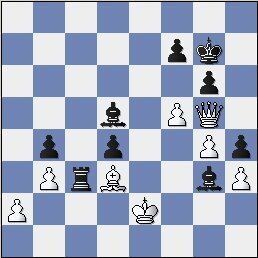 Black had to play …Bd6 to keep any chances alive. Now white wins with a simple tactic. 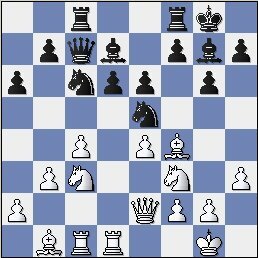 And the unfortunate bishop on c5 is left undefended. Congratulations to Charbonneau on his perfect 4-0 score! Charbonneau is as close as you get to GM strength, especially at game 30. 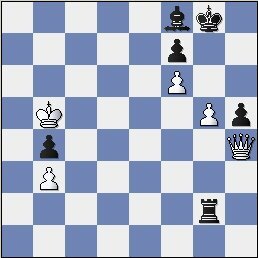 Shabalov got clear 2nd place defeating Bonin with 3/4. Jay has to be commended on his fine tournament, playing a field of 3 very strong grandmasters and scoring 1.5/1.5 against them. It’s a rare 4 round event where you get the chance to play Ehlvest, Shabalov and Stripunsky!